An aerial view of Maryland Point and its environs in 1963. Hi Mick i have seen another Photo of Maryland point Station diferrent to your one i wonder if this entrance was opposite the Cart and Horses pub, Two different Entrances? 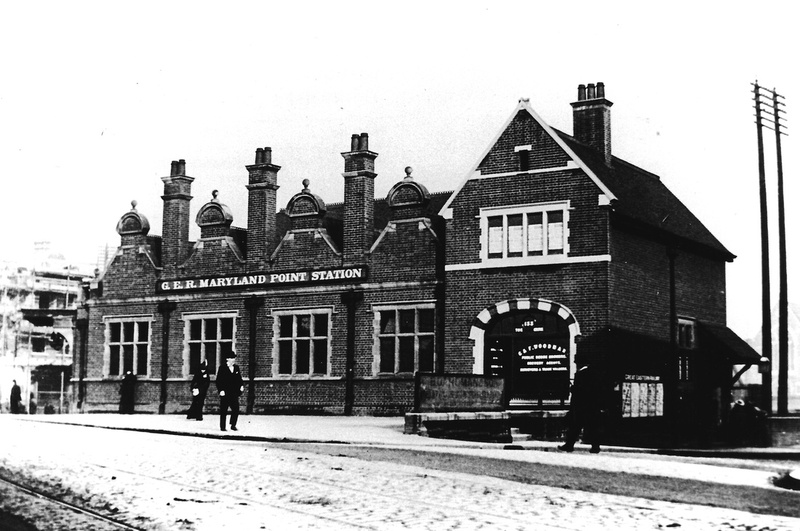 Wikipedia tells us that the station was renamed 'Maryland' from 'Maryland Point' in 1940. Perhaps this is when it was moved to it's current location? Hello Burnsy, I think you are probably correct about the renaming and rebuilding of Maryland Point. Old online Ordnance Survey maps show the station did originally have two entrances, one in Water Lane and the other in The Grove opposite the Cart & Horses pub as Poppy says. I suppose it made financial sense having one entrance for selling tickets to the same people that were previously using two separate ticket offices. Poppy, I think this might be the picture to the other entrance that you saw. 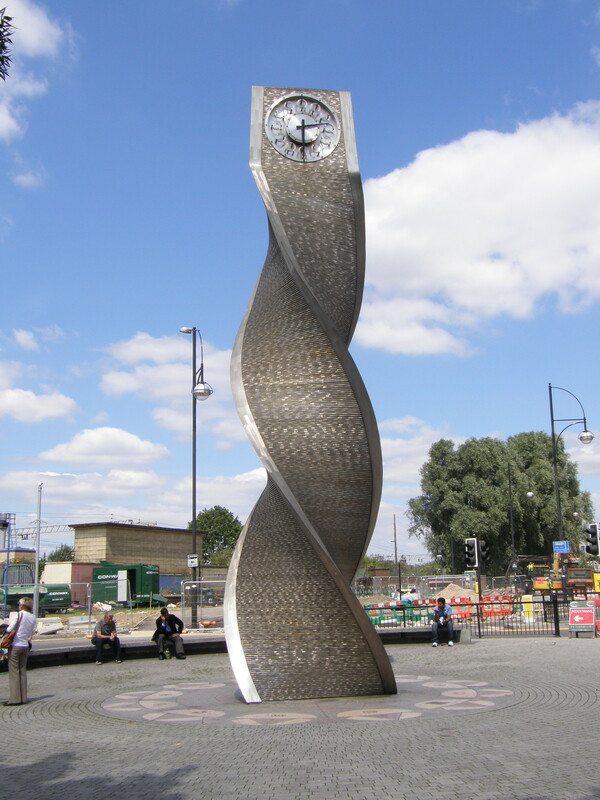 Apparently the Twisted Clock sculpture that was previously located at Stratford Station has now been relocated to Maryland Station. Hi could they be shrapnel marks on the tiles outside Maryland Station , i think the church that was opposite may have got blown up during the blitz,is there any info on the church Bombing ? (you can see the church on the water lane entrance photo). Poppy I did find the extract below on the internet on the recent history of the former Trinity Presbyterian Church at Maryland Point on the internet. Trinity Presbyterian Church, Leytonstone Road, Maryland Point, was founded in 1863 by Andrew Black, of the United Presbyterian Church, who became the first minister (1863-1875). A hall was built in 1864 and the church itself in 1870. It was a brick and stone building in the Gothic style, with a spired angle tower. After early difficulties Trinity flourished under Alexander Jeffrey (1888-1906), the building debt being cleared and communicants numbering over 400, including many seamen. The leading layman at this period was an engine-driver, Alexander Keir. 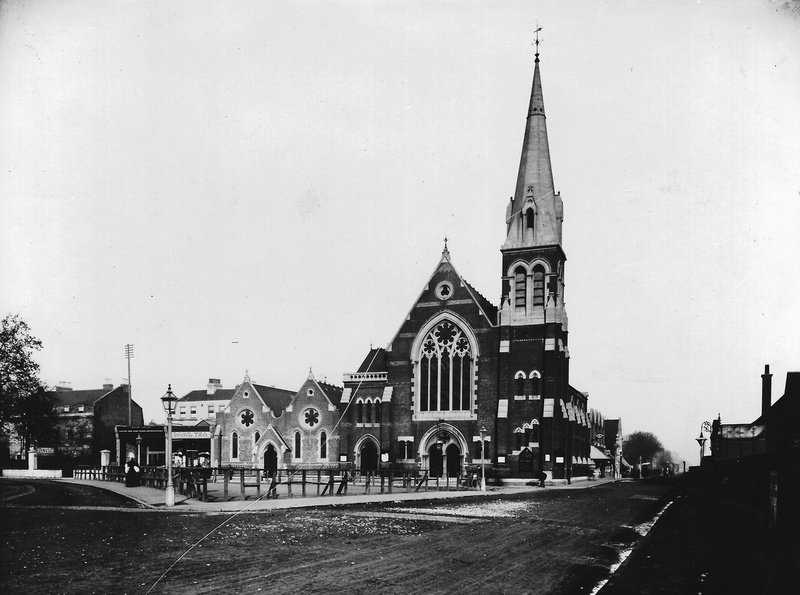 From 1906 the church was declining, and in 1941 it was closed, the members joining East Avenue church, Manor Park, which then took the name Trinity. The Leytonstone Road building, later used as a factory, was destroyed by fire in 1953. The church hall still survived, as a factory. Hi Mick thanks for the info ,i remember reading the church got destroyed,but could not recall how this happened, the tiles look like the ones on the old stratford station 1930s job lot . the tiles also look similar to the ones on Surbiton Station built in the 1930s,also on the platform the Refreshment Room looks like the old Bar on Stratford Station. Page created in 8.561 seconds with 24 queries.